Patients with hereditary α1‐proteinase inhibitor (α1‐PI) deficiency are at risk of developing lung emphysema. To prevent the development of this disease, α1‐PI replacement therapy via inhalation may be a more convenient and effective therapy than the intravenous administration of the drug. In order to optimise this treatment approach, lung deposition of inhaled radiolabelled α1‐PI (Prolastin®) was studied using four different commercial inhalation devices (PARI‐LC Star®, HaloLite®, and AKITA® system in combination with LC Star® and Sidestream®) in six patients with α1‐PI deficiency and mild-to-severe chronic obstructive pulmonary disease. The time required to deposit 50 mg of the Prolastin® (5% solution) in the lung periphery was used as a measure for the efficiency of delivery. The time was calculated from measurements of total and peripheral lung deposition of the radiolabelled α1‐PI. This time was shortest for the AKITA® system (18–24 min) and significantly higher for the PARI‐LC Star® (44 min) and the HaloLite® (100 min). The higher efficiency of drug delivery using the AKITA® system is due to the fact that this device controls breathing patterns, which are optimised for each patient individually. This study was supported by Bayer Corporation, Research Triangle Park, NC, USA. Patients with hereditary α1‐proteinase inhibitor (α1‐PI) deficiency suffer from the lack of a substance that protects the lung from neutrophil elastase, a powerful protease, which is capable of cleaving most proteins in the extracellular matrix. Due to a severely disturbed protease/antiprotease balance, these patients are at risk of developing lung emphysema at a young age, especially if they also smoke 1–3. In order to prevent the development of lung emphysema or to slow down its progression, smoking cessation is essential, and α1‐PI replacement therapy with weekly infusions has been shown to raise serum concentrations and lung epithelium lining fluid α1‐PI, thus restoring the balance between elastase/antielastase activity in the lung biochemically. Although the intravenous replacement therapy showed promising clinical results delaying the progression of the disease, the therapy 1, 4, 5 has the disadvantage that only 2% of the administered drug reaches the lungs 1. This is a severe problem since the worldwide demand cannot yet be satisfied by the pharmaceutical industry's production capacities. In principle, the drug can also be applied directly to the target region within the lungs by inhalation. Nevertheless, a number of problems have to be solved in order to guarantee efficient drug delivery: 1) a sufficient fraction of the drug needs to be deposited within the lungs; 2) the drug needs to be deposited in peripheral lung regions in order to achieve sufficient delivery of protein to the lung interstitium where α1‐PI is supposed to act; 3) drug deposition in the lungs needs to be reproducible and as independent from airway obstruction as possible; and 4) inhalation time should be short enough to be convenient for the patients. The results of previous studies showed that the conditions above may be fulfilled using an optimised, controlled breathing pattern 6, 7. It has been shown that for a deep and slow inhalation with sufficiently small particles and individually controlled breathing patterns, peripheral deposition (Dp) as high as 60% of the aerosolised drug can be achieved 8, 9. Such high deposition values in clinical practice would considerably improve systemic and topic aerosol therapy and would increase the efficiency of α1‐PI replacement therapy. In this study, in six patients with α1‐PI deficiency and mild-to-severe chronic obstructive pulmonary disease (COPD), lung deposition of inhaled radiolabelled α1‐PI (Prolastin®; Bayer Vital., Leverkusen, Germany) was studied using four different commercial inhalation devices. It was investigated whether controlled inhalations with carefully selected breathing patterns provide a considerable improvement of the efficiency of drug delivery compared with conventional spontaneous breathing patterns. Six patients (four male, two female) with hereditary α1‐PI deficiency (Z‐phenotype) and a mildly to severely reduced lung function, aged between 43–73 yrs (median 59 yrs) participated in this study (table 1⇓). Four patients were nonsmokers and two patients were exsmokers and had stopped smoking ⩾5 yrs before participating in the study. All patients obtained α1‐antitrypsin-deficiency replacement therapy by weekly i.v. infusions of Prolastin® and bronchodilators as required. Written informed consent was obtained from each patient. The study protocol was approved by the Ethics Committee of the Medical School of the Ludwig-Maximilians-University (Munich, Germany) and the responsible regulatory authorities. Body plethysmographic and spirometric parameters of lung function were determined by using a Jaeger-Masterlab (Erich Jaeger GmbH, Würzburg, Germany). The following parameters were measured: total lung capacity (TLC), inspiratory vital capacity, intrathoracic gas volume (ITGV), airway resistance, peak expiratory flow rate and forced expiratory volume in one second. Measured lung function parameters were normalised to the reference values proposed by the European Community for Coal and Steel 10. In this study the following commercial inhalation systems were applied for the inhalation of radiolabelled Prolastin®. 1) PARI‐LC Star® Jet nebuliser with “Turbo Boy” Compressor (Pari, Starnberg, Germany). The nebuliser is manually activated at the start of inhalation. 2) HaloLite® (Medic Aid, West Sussex, UK). This computer-controlled device applies the “adaptive aerosol delivery” technique. If the patients start inhalation, during a certain number of breathing cycles the breathing pattern of the patients is measured by the device. Then an aerosol bolus is emitted for a certain period within the first 50% of inhalation. To collect the exhaled particles, an exhalation filter was adopted to the HaloLite® using silicon fittings. The proper performance of the device after this manipulation was tested by the manufacturer. 3) AKITA® (Inamed, Gemünden, Germany). This computer-controlled device allows individualised, controlled inhalations in combination with conventional nebulisers. Using an individual smart-card for each patient the inhalation flow rate, inhaled volume and a breath-holding period can be presicely predetermined. The pressured air for the nebuliser is delivered by a compressor integrated into the AKITA®. In this study, the AKITA® was used in combination with either a “PARI‐LC Star®” nebuliser or a “Sidestream®” nebuliser (Medic Aid). The order in which the subjects inhaled from the different devices was randomised. The three different devices are similar in size (PARI‐LC Star® 150×165×280 mm, HaloLite® 140×180×290 mm, AKITA® 260×170×270 mm), but the AKITA® system had the highest weight (PARI‐LC Star® 2.7 kg, HaloLite® 2.7 kg, AKITA® 7.5 kg). The particle size distribution of each nebuliser used in this study was measured using an eight-stage cascade impactor (Mark 2) using radiolabelled Prolastin®. The following values for the mass median aerodynamic diameter (MMAD) and the geometric standard deviation were found. PARI‐LC Star®: MMAD=4.4 µm, sd=2; HaloLite®: MMAD=3.7 µm, sd=2; AKITA® /LC Star®: MMAD=3.8 µm, sd=2; AKITA®/Sidestream®: MMAD=3.9 µm, sd=2.1. Each nebuliser was filled with 3 mL radiolabelled Prolastin® containing 150 mg of Prolastin® and the patients inhaled for 5 min. Since all patients perform normal inhalations using jet nebulisers, they were asked to inhale normally using the LC Star® and to activate the nebuliser during inhalation. Exhalation was performed into an exhalation filter. Patients were asked to inhale normally. Exhalation was performed into the device which had a filter included. The breathing pattern used in the AKITA® was derived from in-vivo studies in which the optimum breathing patterns for a high peripheral lung deposition were investigated 8, 9, 11. From this study, the flow rate was derived as 200 cm3·s−1 and the inhaled volume (TLC‐ITGV) as 0.8, individually calculated and stored on the smart card. The subject was asked to start the inhalation. If a pressure drop at the mouth is measured the AKITA® activates the inhalation by applying pressure to the nebuliser nozzle and a constant, predefined amount of air is delivered to the nebuliser's auxiliary air inlet at a constant flow rate. The last 200 mL of the inhalation were free of drug aerosol to avoid useless drug deposition in the dead space of the lungs. After the predefined inhalation volume is reached, the air supply is turned off and the patient is instructed to perform a 2‐s breath-holding period. The patient is instructed via the display of the device. The average inhalation volume calculated for the AKITA® was (mean±sd) 1.76±0.29 L. For all other devices, nothing is known about the actual breathing pattern used for inhalation. The prodedure to label Prolastin® with 99mTc used in thisstudy was modified from the method published by Lafont et al. 12; an isotonic NaCl solution containing 5% of Prolastin® was reconstituted in a closed vial. From this solution, a stock solution of ∼1 mL was separated. To this solution, 50 µL of a SnCl2 solution was added as a reducing agent. 99mTc (185 megabequerel (MBq)) was then introduced by adding a Na99mTcO4 solution. After gentle shaking the solution was incubated for 30 min. The efficacy of the labelling procedure was verified by comparing the size distributions, the radioactivity and dry mass of Prolastin® using an Andersen Cascade Impactor (Typ Mark II; Copley Scientific Ltd, Nottingham, UK). The radiolabelled Prolastin® solution was then diluted, for each inhalation device, in order to limit the radioactivity available for inhalation to 1.6 MBq. The stability of the labelling was verified using thin-layer chromatography as described by Lafont et al. 12. It was verified that the size distribution of the particle mass was the same as the distribution of radioactivity using a cascade impactor. where At is the activity measured in the thorax regions of interest and Ah is the activity measured in the head and stomach area. During the following 45 h the remaining lung activity was measured up to eight times with a sensitive lung counter to quantify a fast and slowly cleared fraction (Aslow). Therefore, a double exponential function was fitted to the measured decline in lung activity and the slow component of this function was extrapolated to time zero (Aslow). This slow-cleared fraction is assumed to be a measure of the amount of particles being deposited in the lung periphery, while the fast-cleared fraction is assumed to be due to particles cleared by mucociliary clearance from central airways. Deposition, in this study, was defined as the amount of particles deposited in comparison with the amount of particles inhaled. This definition of deposition delivers higher values than other definitions, which relate the deposited drug amount to the amount filled into the nebuliser. However, the definition used in this study was more appropriate to assess the inhalation time. where M is the α1‐PI dose filled in the nebuliser. Differences in deposition and treatment time among the different devices were tested for statistical significance using a paired t‐test. Therefore, the differences for each subject and each parameter obtained for the different devices were subtracted from each other. For each of the six differences, the hypothesis that this difference is zero was tested using the paired t‐test. Correlations were calculated using Pearson product-moment correlation analysis. Figure 1⇓ shows, as an example, the decline in lung radioactivity over 45 h in all patients after inhalation with the AKITA® LC Star® combination. After 45 h >50% of the radioactivity was still found within the lungs, indicating thestability of the drugs radiolabelling. Table 2⇓ shows the mean±sd Dt and Dp of radiolabelled α1‐PI inhaled with different inhalation devices in per cent of nebulised α1‐PI in six patients with α1‐PI deficiency and mild-to-severe emphysema. The mean value for Dt for the PARI‐LC Star® and for the HaloLite® is in the order of 50–60% (fig. 2⇓) of nebulised Prolastin® and Dp in the order of 30–35% (fig. 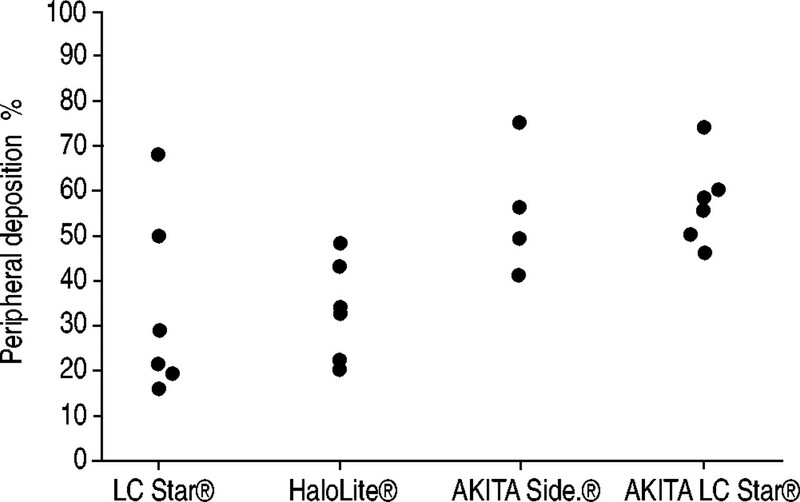 3⇓); both AKITA® combinations, AKITA® Sidestream® and AKITA® LC Star®, reach 75–80% for Dt and 50–60% Dp. 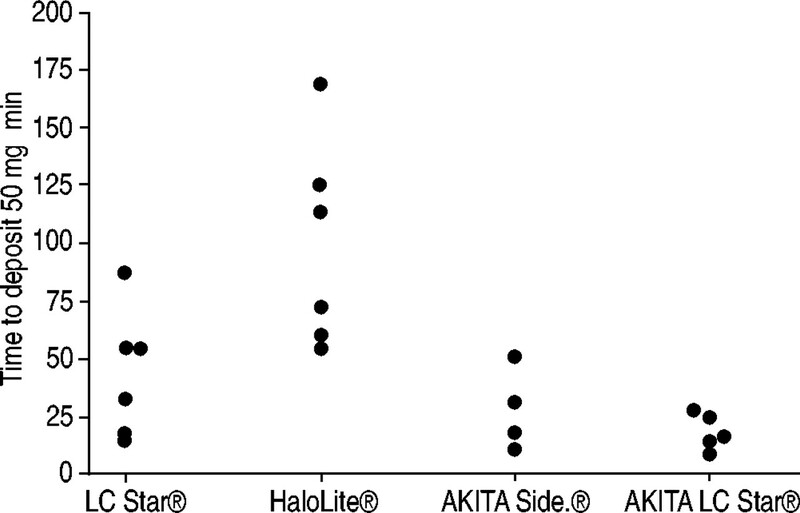 As can be seen from table 3⇓, these differences are statistically significant (paired t‐test) whereas there were no significant differences between the results obtained for the HaloLite® and the PARI‐LC Star® nor between the AKITA® Sidestream® and the AKITA® LC Star® (only Dt). 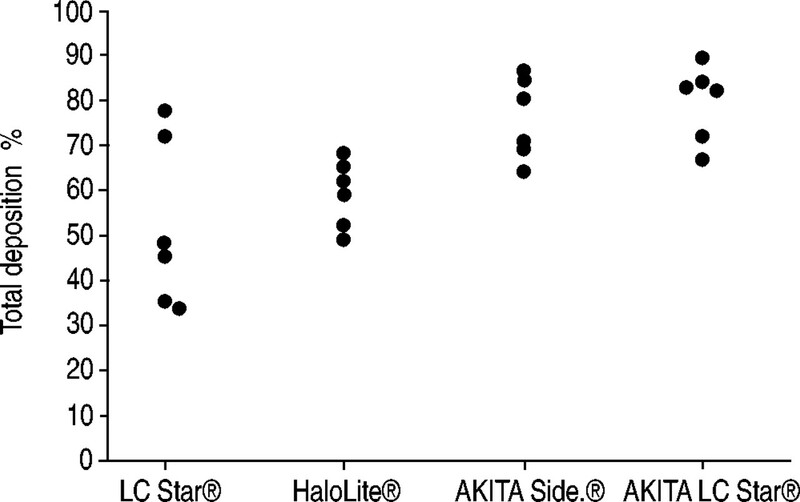 Due to the higher deposition values the time required to deposit 50 mg of α1‐PI in the lung periphery was significantly shorter for both AKITA® devices compared with HaloLite® and LC Star® (fig. 4⇓ and table 2⇓). The intersubject variability for each parameter was highest for the LC Star® device and lowest for the AKITA® LC Star® combination (table 2⇓). 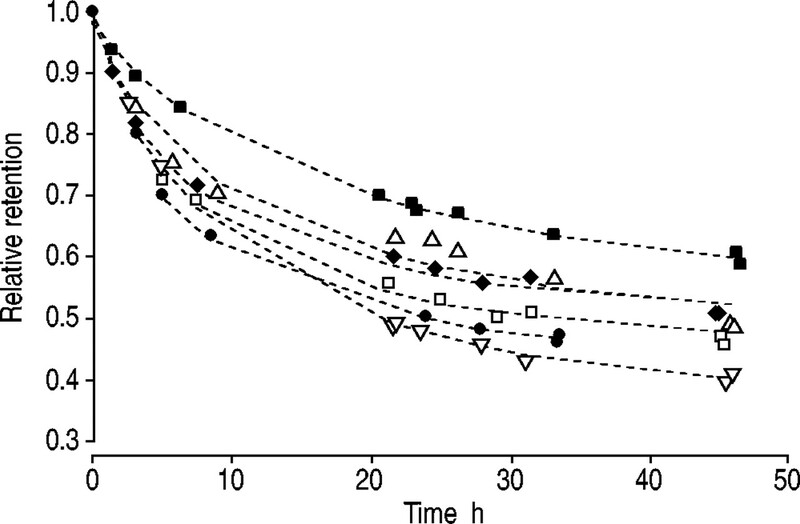 Lung retention of inhaled radiolabelled Prolastin® as a function of time for six subjects inhaling with the AKITA® LC Star® combination. Total deposition measured in six patients with α1‐protease inhibitor deficiency using different inhalation devices. Side. : sidestream. Peripheral deposition measured in six patients with α1‐protease inhibitor deficiency using different inhalation devices. Side. : sidestream. Time required to inhale 50 mg of α1‐protease inhibitor measured in six patients with α1‐protease inhibitor deficiency using different inhalation devices. Side. : sidestream. Although there was a tendency that patients with the most impaired lung function needed the longest time to deposit 50 mg of Prolastin® in the lung periphery, this tendency failed statistical significance, which may be due to the small number of subjects. This study has shown that the highest Dt and Dp of inhaled radiolabelled α1‐PI and the shortest inhalation times can be obtained using an optimised breathing pattern, which is controlled by a device like the AKITA®. If a conventional nebuliser is used without control of the breathing pattern, deposition is quite heterogeneous. Some patients show high Dp values similar to the controlled case, but in others, deposition <20% is found. As a previous study has shown 6, these heterogeneous deposition values can be explained by the hetereogeneity of the breathing pattern. Basically, it was found that deposition is highest if the patient is ordered to inhale deeply ⩾1.5 L 8, 9, 11. In this case, most of the drug is able to penetrate into the lung periphery and its residence time is long enough for complete deposition by sedimentation. Such deep inhalations can be maintained using the AKITA® device which allows a programming of the inhaled volume according to the individual lung function of the patient. Using this individual approach, each patient inhales the largest possible volume that is still convenient for them. Additionally, the inhalation flow rate is fixed to values which are slow enough (200 mL·s−1) to prevent deposition by impaction in obstructed proximal airways 6. The results obtained with the AKITA® device seems to be independent of the nebuliser actually used. Although the AKITA® LC Star® combination tended to show higher deposition and lower inhalation times than the AKITA® Sidestream®, these small differences were not statistically significant. In the HaloLite® device, inhalation is also controlled. However, this control is passive and maintained by an adaptation of the nebulising process to the patients arbitrary breathing pattern. An aerosol bolus is introduced into the inhalation at the beginning of each breath. The patient is not led through the inhalation under optimum conditions, but is free to inhale slowly or fast, shallow or deep. However, the main disadvantage of this device is the bolus application of the drug aerosol. Due to this technique, only a small fraction of the inhaled air contains aerosol and the drug amount applied by each breath is limited. This is the reason for the very long times necessary to deposit 50 mg of drug using this device. This time was on average ∼5‐times longer than the times obtained with the AKITA® combinations. The HaloLite® may be an appropriate device for the dosing of low amounts of a potent drug, but in situations where a large amount of drug has to be applied, the bolus technique seems to have significant disadvantages. In this study, the time to deliver 50 mg of Prolastin® was calculated from the amount deposited in 5 min. This extrapolation may overestimate the real time, since in the course of time the drug remaining in the nebuliser may be concentrated due to water evaporation and therefore, the nebuliser output may change. However, this extrapolation of time seems to be reasonable if different devices are compared with each other. In this study Dp was quantified by calculating the slow cleared particle fraction Aslow. This parameter was chosen instead of the usual 24‐h retention value with regard to the solubility of the used drug. Slow clearance can be attributed to both particle clearance as well as drug translocation into the blood circulation. If the slow particle clearance kinetics are extrapolated to time zero to assess Aslow, this value quantifies the initial amount of particles, which are not subject to fast mucociliary clearance regardless of whether slow clearance is due to particle clearance or absorption. However, the assessment of alveolar deposition by the measurement of slow particle clearance is based on the assumption that bronchially deposited particles are fast cleared by mucociliary clearance, whereas particles being deposited in the alveolar space are cleared slowly by macrophages. However, some studies indicate that there is considerable slow clearance from presumably peripheral bronchi 15–19. Therefore, it has to be considered that some drug included in the fraction present after 24 h may be deposited within this peripheral, conducting airway. Whether this drug fraction is really “lost” for α1‐PI replacement therapy, however, is yet unclear. In addition, it is possible that respiratory bronchioles may benefit from a restoration of the protease/antiprotease balance. In this study it has been shown that high peripheral deposition of radiolabelled α1‐protease inhibitor can be obtained using an optimised and controlled breathing pattern. Inhalation devices using this concept allow efficient drug deposition in a considerably shorter time period than conventional devices or devices with different optimisation concepts, and guarantee a constant dosing with low interpatient variability. Hubbard RC, Crystal RG. Strategies for aerosol therapy of alpha1-antitrypsin deficiency by the aerosol route. Lung Suppl 1990;168:565–578. Perlmutter DH, Pierce JA. The alpha1-antitrypsin gene and emphysema. J Appl Physiol 1989;257:L147. Pierce JA. Antitrypsin and emphysema. JAMA 1988;259:2890. Hubbard RC, McElvaney NG, Sellers SE, Healy JT, Czerski DB, Crystal RG. Recombinant DNA‐produced a1-antitrypsin administered by aerosol augments lower respiratory tract antineutrophil elastase defenses in individuals with α1‐antitrypsin deficiency. J Clin Invest 1989;84:1349–1354. Wewers MD, Casolaro MA, Sellers SE, et al. Replacement therapy for alpha1-antitrypsin deficiency associated with emphysema. New Engl J Med 1987;316:1055–1062. Brand P, Friemel I, Meyer T, Schulz H, Heyder J, Häußinger K. Total deposition of therapeutic particles during spontaneous and controlled inhalations. J Pharmaceutical Sci 2000;89:724–731. Brand P, Meyer T, Sommerer K, Weber N, Scheuch G. Alveolar deposition of monodisperse aerosol particles in the lung of patients with COPD. Exp Lung Res 2002;28:39–54. Scheuch G, Meyer T, Müllinger B, et al. Controlled inhalation improves peripheral lung deposition. J Aerosol Med 2001;14:388. Sommerer K, Meyer T, Brand P, et al. Evaluation of an optimal device for peripheral deposition in patients with lung emphysema. Drug Deliv Lungs 2001;XII:171–174. Quanjer PH, Tammeling GJ, Cotes JE, Pedersen OF, Peslin R, Yernault JC. Lung volumes and forced ventilatory flows. Eur Respir J 1993;6:5–40. Müllinger B, Meyer T, Sommerer K, et al. Patient individulized inhalation optimizes peripheral lung deposition. Drug Deliv Lungs 2001;XII:23–26. Lafont P, Bellon G, Mein Tapponnier N, Meurisse G, Barbier Y. Alpha 1 antitrypsin labeling with technetium 99m for monitoring the deposition of alpha 1 antitrypsin in aerosol therapy. Nucl Med Biol 1998;25:509–513. Stahlhofen W, Gebhart J, Heyder J. Experimental determination of regional deposition of aerosol particles in the human respiratory system. Am Ind Hyg Assoc J 1980;41:385–399. Kreyling WG, Scheuch G. Clearance of particles deposited inthe lungsIn: Gehr P, Heyder J, editors. Particle-Lung InteractionsNew York, Marcel Dekker, 2000; pp. 323–376. Stahlhofen W, Koebrich R, Rudolf G, Scheuch G. Short-term and long-term clearance of particles from the upper human respiratory tract as function of particle size. J Aerosol Sci 1990;21:S407–S410. Svartengren M, Sommerer K, Scheuch G, et al. Comparison of clearance of particles inhaled with bolus and extremely slow inhalation technique. Exp Lung Res 2001;27:367–386. Gehr P, Im Hof V, Geiser M, Schürch S. The fate of particles deposited in the intrapulmonary conducting airway. J Aerosol Med 1991;4:349–361. Stahlhofen W, Scheuch G, Bailey MR. Investiagations of retention of inhaled particles in the human bronchial tree. Radiat Prot Dosimetry 1995;60:311–319. Scheuch G, Stahlhofen W, Heyder J. An approach to deposition and clearance measurements in human airways. J Aerosol Med 1996;9:35–41.